Business & Mission Mission Statement: The exclusive Arizona Mountain School of Real Estate Salesperson and Broker Course offers students from Sedona, Camp Verde, Cottonwood, Kingman, Bullhead City, Prescott, Holbrook, White Mountains, and Phoenix areas to join Flagstaff students with a minimum of travel and lodging time and expense. Business Philosopy: Kurt Wildermuth, Director: Kurt Wildermuth is a well-known,sought-after, and popular real estate educator. He's developed and taught Arizona salesperson and broker pre-licensing courses plus continuing education classes since 2005. Additionally, he has served as principal instructor, associate director of education, director, and administrator of Arizona real estate schools in past positions. All certified instructors at Arizona Mountain School of Real Estate must hold active Arizona Department of Real Estate Broker's Licenses. They must also demonstrate expertise and experience in the subject matter they teach and be actively employed and engaged in Arizona real estate brokerage. 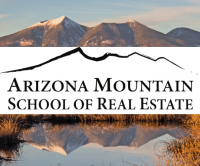 The Arizona Mountain School of Real Estate faculty are also expected to set high standards for professional activity. One certified instructor, for example, developed and led a workshop on real estate curriculum development at the national conference of the Real Estate Educator's Association in Scottsdale last spring. These strict requirements result in instructors and administrators who excel in modern real estate practice, remain in touch with challenges and changes in Arizona real estate, are well grounded in real estate scholarship, and meet high expectations for teaching expertise. Service Promise: Completion of the Arizona Mountain School of Real Estate classes and passage of the Arizona Department of Real Estate license examination allows graduates to build full- or part-time careers in new home sales, residential resale, rentals and property management, timeshare, resort and vacation properties, farm and ranch land, commercial and industrial properties, investing, and syndication.